Great look , a little narrow, grey color looks perfect with casual and even formal jeans. I already own two pairs and they are excellent quality and stylish. comfort and style. like the edgy look. can't wait til they arrive! They haven't arrived yet so I can't be sure, but they look to be a nice step up from sneakers: comfortable and supportive but with a bit of style to them as well. Based on my prior positive experiences. combination of colors combine with white sole. These sneakers are attractive and fit well. Need for upcoming travel. Love the looks. I like the combination of this color pattern and simple form. 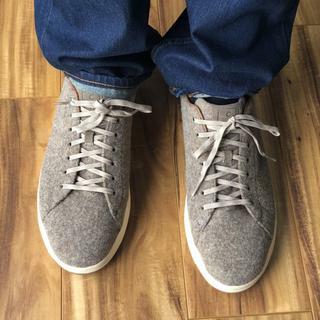 Best looking grey tennis shoe I have found! Neon green details a plus! Why code EXTRA30 is unknown? BEST ANSWER: If the code is not being recognized at checkout, either it has expired, the sale has expired or the item you want to use it on is not eligible for further discounts. How would you spot treat this shoe? BEST ANSWER: This style has textured nubuck uppers. You can keep your nubuck and suede shoes looking sharp with a little bit of regular care. Use a suede brush or bar to remove loose surface soil and to restore the nap of the leather. Occasional application of suede protector - applied according to manufacturer directions - will provide a light coating of protection and should be re-applied occasionally.